There are few personal possessions with as much sentimentality attached to them as a diamond. Diamond jewelry is usually linked to memories as precious as the stone that represents them, echoing the well-known phrase “diamonds are forever”. However, as we all know, life can throw an unexpected curve at each one of us at any given time, and for that reason it can become necessary to part with our most valued and cherished material items sometimes. While this is a difficult prospect for most involved, there is at least some good news. Diamond prices have steadily risen since 2011 as a result of a growing middle class population in China and India who desire diamonds. What this means in the U.S is that many jewelers can no longer afford to purchase from wholesalers, and instead they are turning to diamonds purchased from the public. So, the good news is, it is a seller’s market, the bad news is that it can be a difficult process with some pitfalls if you don’t know what you’re doing and don’t visit a trusted and reputable buyer. While the “Four C’s” of Cut, Color, Clarity and Carat are important in selling (and buying) a diamond, a fifth C could be added…complicated. 1. What’s it worth? Know what you’ve got. While a formal appraisal is not absolutely necessary (they can be very expensive), it is a wise idea to get a verbal appraisal from a trusted jewelry buyer or pawn shop. These types of appraisals will give you a good idea of what your item is worth before you sell it. As always, it is critical to find a professional buyer with a good reputation when getting any appraisal. 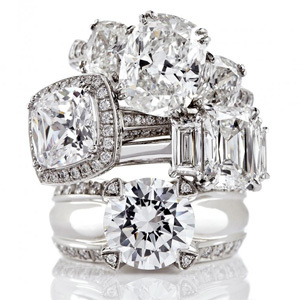 At Jewelry-N-Loan our jewelry professionals have years of experience and our reputation is sterling. Your appraisal with us will include a thorough report complete with market values and high-resolution color photography. 2. Have you done your homework? Know your selling options. Upon getting an appraisal a realistic price needs to be set based on the information you’ve received. After that a decision needs to be made to sell it to private buyer via a source like eBay, or to sell to a professional jewelry buyer or pawn shop. While private buyers may end up paying more for the stone, there are some disadvantages to choosing this option. First, is time. Finding the right buyer at the right price can be a long drawn out process that requires a lot of back and forth and monitoring sites like eBay, Craigslist, etc. In the end the time spent may not be worth the small increase in sell price. Second, is security/trust in the private transaction. Collecting payment from a private buyer doesn’t come with the security that is available when selling to a professional diamond buyer. Both of these disadvantages involve filtering out the weirdos and cons in order to find someone trusted. This is not to sat it can’t be done, but when selling a diamond to a trusted professional you can ensure yourself of bypassing these type of headaches. At Jewelry-N-Loan, we can offer a professional, competitive, secure and easy transaction to make the entire process simple and painless. 3. Are you ready to sell? Know yourself. Are you emotionally ready to sell? Is the cash you’re going to receive worth more than your attachment to the piece? These are just some of the questions anyone looking to sell their diamond needs to ask themselves. Sometimes even if the answer to these questions are “no” there is still a financial need to sell. However, not seriously considering all of this prior to selling can lead to a lifetime of regret, and so it is an important factor in the process. While only you know the real answers, talking with a professional jewelry buyer or pawn shop owner who has years of experience in this matter may help you make your final decision. Jewelry-N-Loan has a knowledgeable and trusted staff with a combined 50 years experience in the jewelry and watch business. We take the time to carefully evaluate the specific needs and wants of each customer and recommend an appropriate solution to benefit all parties involved, even it that means passing on a deal. You won’t find a more “even-handed” and honest approach when selling your precious diamond jewelry. Jewelry-N-Loan is conveniently located in the old town stretch of Costa Mesa, CA. You can’t miss our vintage storefront just off the end of the 55 Freeway on Newport Boulevard. Our charming building was originally an ice cream parlor in the 1950’s and over the years has seen several transformations before becoming the high-end pawn shop that is Jewelry-N-Loan. Previous PostBuying A Used DiamondNext PostHow Much Is Your Watch Worth?